Do you feed your dog Fromm Pet Food? Did you also know Argyle Feed & Hardware has the best prices on Fromm Dog & Cat Food Formulas? During September, we’re saving you even more money when you purchase your pet’s preferred Fromm formula. Take advantage of our best deal yet! Offer good now through 9/30/16 only at Argyle Feed & Hardware. Not combinable with any other offers; valid on one-time purchases only. Fromm Family Pet Foods are created using fresh, nutritious ingredients, plenty of animal proteins, and healthy, allergen-free fruits, vegetables and grains. A quick look at the ingredient list for any of the Fromm formulas, dry or canned, reveals protein at the top of the list, including fresh duck, salmon, beef and chicken. You and your pets are sure to love it! Fromm Four-Star offers cats the variety they deserve. We’ve designed every recipe in our line to complement each other, allowing you to switch between and combine recipes. Your cat’s dining experience will never be the same again. A holistic approach to complete and balanced nutrition for each life stage and lifestyle. Available in three categories: Fromm Prairie Gold (grain-free red meat), Fromm Gold Coast (grain-free ocean fish), and our original Fromm Gold (duck, chicken, & lamb). Prepared in small batches with fresh ingredients delivered daily, our Gold dry recipes feature duck, chicken, and liver combined with whole eggs and real Wisconsin cheddar cheese. 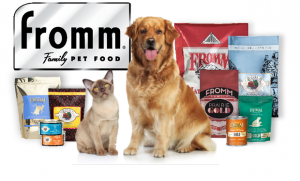 All Fromm Family Pet Food is locally-sourced in the USA. We always have FREE samples in the store— Stop into Argyle Feed now through September 30th and save even more on our already best pricing on Fromm Pet Food! This entry was posted on Thursday, September 1st, 2016 at 6:51 am	and is filed under Events, News & Updates. You can follow any responses to this entry through the RSS 2.0 feed. Both comments and pings are currently closed.